“New Frontier Days~Founding Pioneers~” is the brand new, expanded entry in the New Frontier Days series, a town-building simulation game, where you command your pioneers to colonize a new land. A town-building simulation game, “New Frontier Days~Founding Pioneers~” was first released as a Nintendo 3DS downloadable eShop game and became a big success. The game has now been introduced to the Nintendo Switch, with brand new features coming along with it! Boasting additional story modes and new elements, “New Frontier Days~Founding Pioneers~” is perfect for old and new fans alike! Your pioneers are capable of many tasks such as Logging, Mining, Hunting, and many more. Using the resources gathered by your pioneers, you can then use them to build a variety of structures! New buildings allow you to do many things, such as process logs into lumber, weave wool into textiles, grow plants in the field… the list just goes on! Guide your pioneers in their tasks to help build your frontier town efficiently! Story Mode: Build the greatest frontier settlement you can alongside your assistant Jessica, complete with quests and goals to strive for! Survival Mode: 5 different difficulties to tackle! A level of challenge perfect for all players! Free Mode: No game overs. No stress. Just enjoy yourself and play til your heart’s content. Invention Cards: As you progress in colonizing the land, you may obtain “Invention Cards” along the way. These cards provide various effects, such as shortening your farm harvesting time cycle, and increasing the fishing time and etc. There are over 290 cards in the game! Can you collect them all? You can also keep wild animals as pets. Pets can go out with the pioneers to gather materials, or they can help in hunting, and even allow pioneers to ride on their backs! 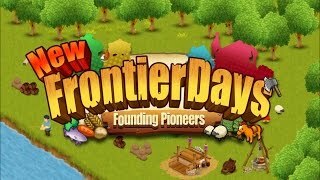 New Frontier Days ~Founding Pioneers~ Available Today on Steam!